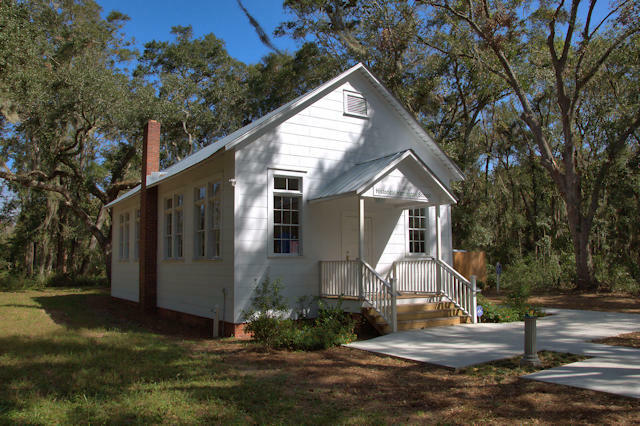 The recent restoration of this historic African-American schoolhouse is one of the greatest preservation successes on the Georgia coast and should serve as a model for similar projects. After the Civil War and the collapse of the plantation economy, the descendants of enslaved persons remained on St. Simons and lived in the communities of South End, Jewtown, and Harrington. They were the dominant population on St. Simons until development in the early and mid-20th century changed the racial makeup of the island. 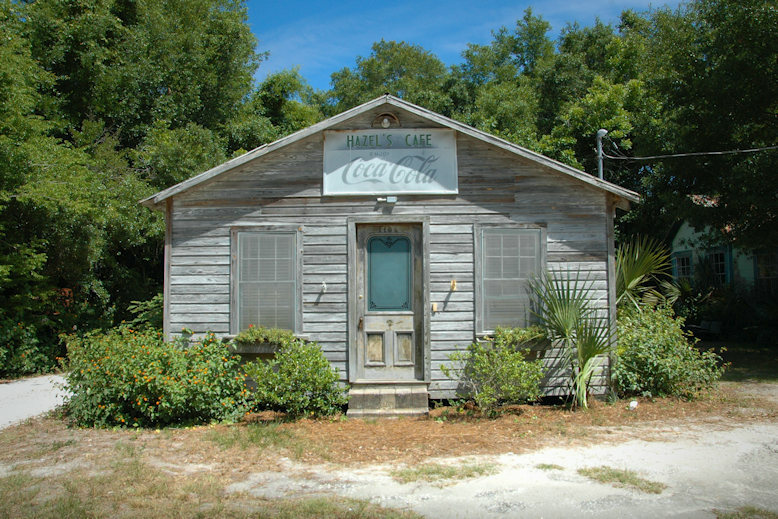 Only remnants of their presence remain, and among them, the Harrington Graded School (thought to be a Rosenwald school), and Hazel’s Cafe, are the most significant. 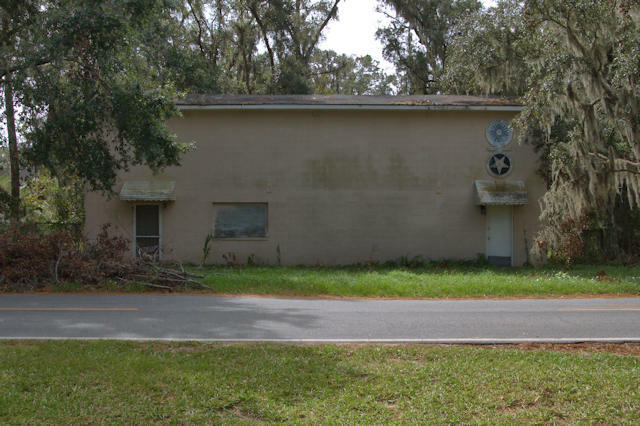 The school served all three African-American communities until desegregation in the 1960s and was briefly used as a day care center until being abandoned in the early 1970s. It was eventually purchased by Glynn County and the St. Simons Land Trust but due to deterioration, it was slated for demolition in 2010. The Land Trust and the St. Simons African American Heritage Coalition formed the Friends of Harrington School and saved the school house. Serious work began in 2015 and by December 2016, the school was restored to its former glory. This interesting church in the Harrington community was built just as the historic African-American neighborhoods of St. Simons were reaching their ebb. 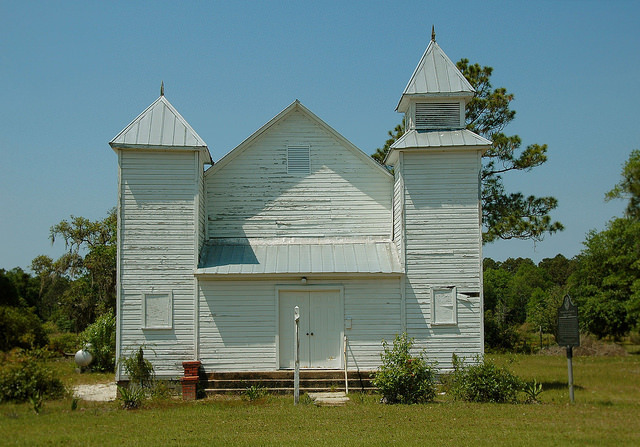 It’s a utilitarian example of the two-tower style, common among African-American congregations on the coast in an earlier time. The cinderblock structure, built sometime between 1950-1954, has unpainted sides, with the front being the only “finished” section. A more traditional structure, the circa 1920 Pentecostal Zion Church, stands behind this one. 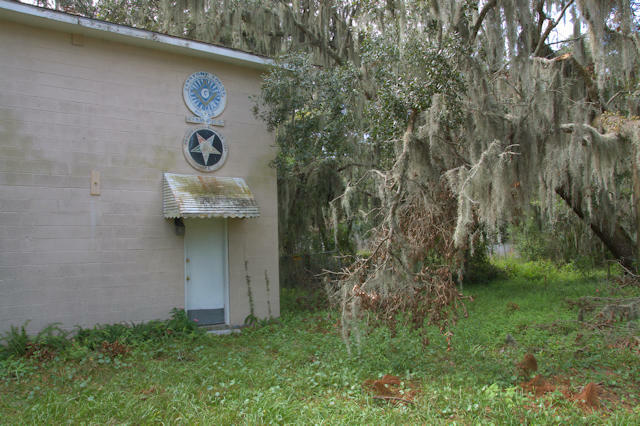 Fraternal lodges were important gathering place for the historic African-American communities of the Georgia coast. The Keystone Lodge No. 98 Free & Accepted Masons, Prince Hall Affiliated, is an important part of the Harrington community. This lodge, which I understand is still active, is also home to the Progressive Chapter 139, Order of the Eastern Star. 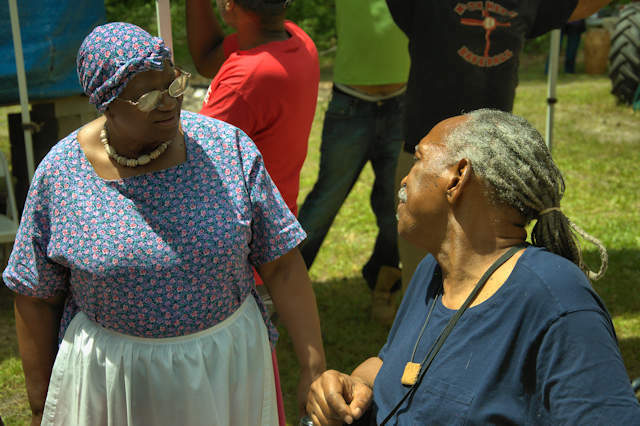 I drove down to Riceboro yesterday to see the wonderful work Jim Bacote (above, right) has done with Geechee Kunda and to check out his Gathering, an annual celebration of Geechee and Gullah folkways. Jim is passionate about preserving this history and it’s tangible. 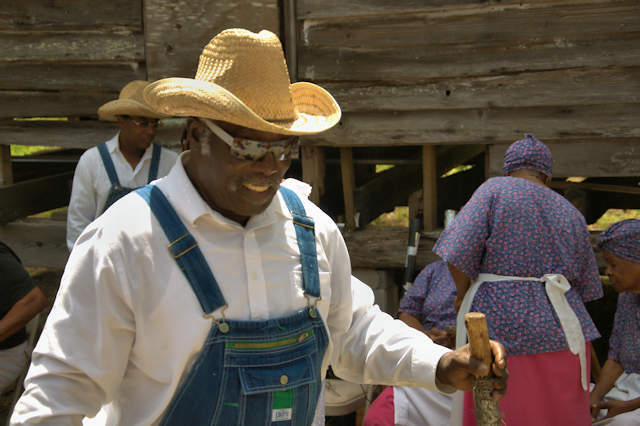 Geechee Kunda is the culmination of his lifelong fascination with this endangered way of life. I first met him a couple of years ago when he was still working on his museum and history center so I didn’t get to make any photographs. He invited me to come back and I’m so glad I finally got to see it yesterday. 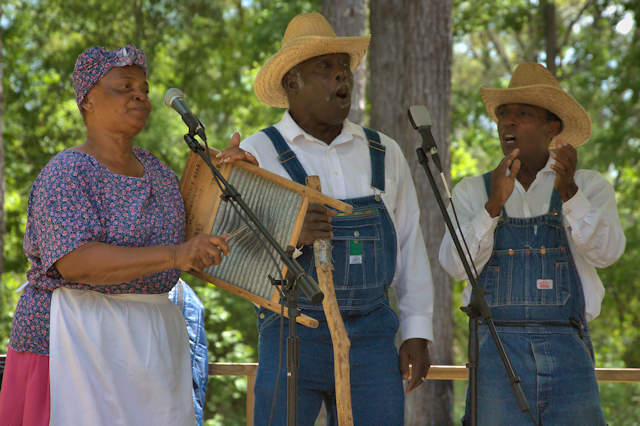 The highlight for me was a performance by the Geechee Gullah Ring Shouters (not to be confused with the McIntosh County Shouters, who organized about a decade before the Geechee Gullah). This group of dedicated men and women share the ring shout with the world and aim for authenticity. 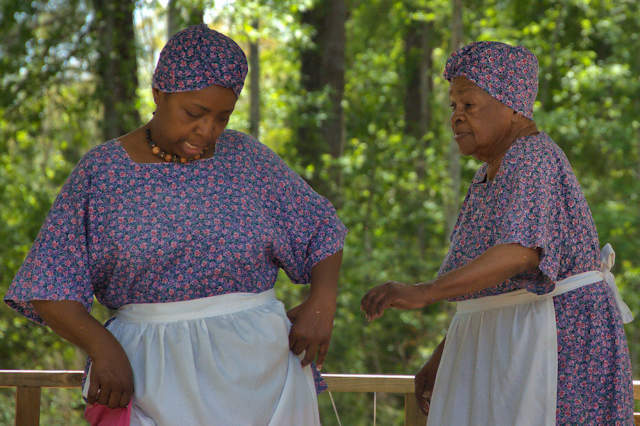 They’re historic interpreters of the highest order and preserve a tradition that was thought to be extinct as recently as 1980. 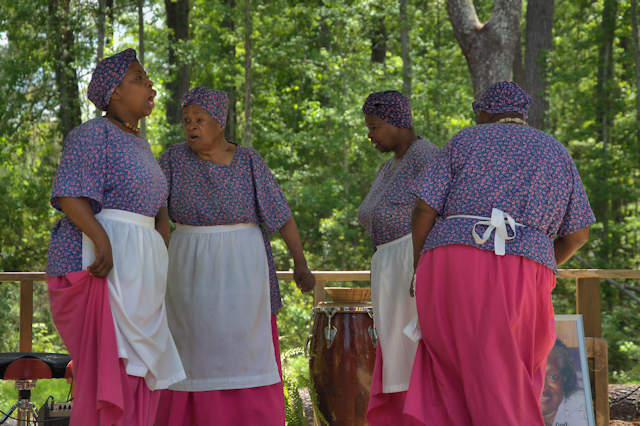 Historians believe the ring shout is the oldest surviving African performance tradition in North America. 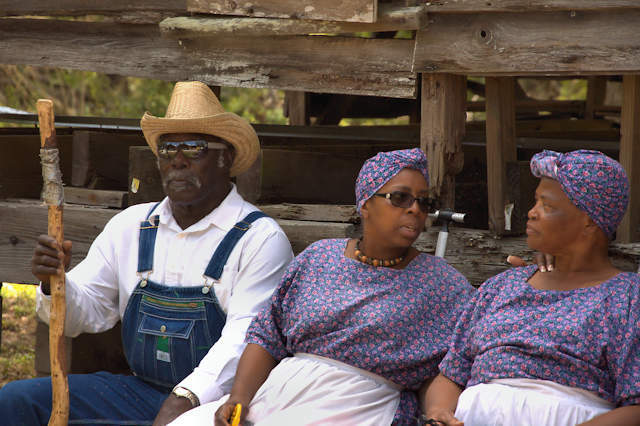 While “shouting” in the vocal sense is a part of the performance, linguist Lorenzo Dow Turner, who spent a lifetime researching the Gullah language and culture, suggested that the term came from the Afro-Arabic word saut. This is a reference to the forward-moving shuffle, during which the feet are not to cross, associated with pilgrimages to the Kabaa at Mecca. 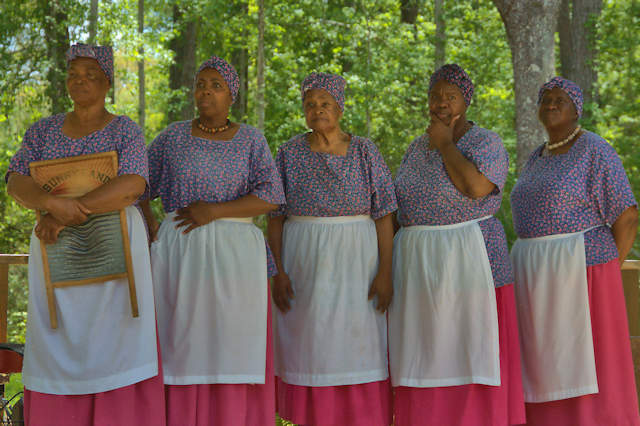 It’s hard not to come away from a performance by the Geechee Gullah Ring Shouters with a better understanding of a culture that, especially as white Southerners, we have kept at a distance at best or dismissed altogether at worst. One thing you’ll quickly notice when you’re around the Shouters is their charisma. They’re very passionate about what they’re doing and you can feel it. You not only learn but you’re uplifted, as well. 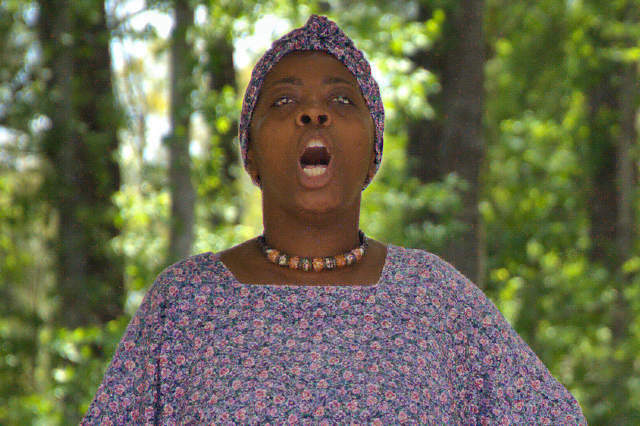 In 2011, the Geechee Gullah Ring Shouters set the Guinness World Record for leading the largest recorded ring shout, during the “Word, Shout, Song” exhibit at the Smithsonian’s Anacostia Community Museum in Washington, D. C.
Besides the world record ring shout, the group is also proud to have among their performers Mrs. Butler (above, right), who at 90 is the world’s oldest living ring shouter. She’s amazing. 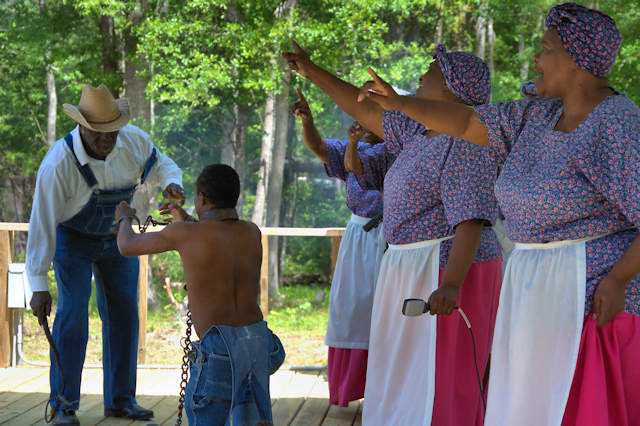 At the end of the performance, a narrative of Emancipation is re-enacted and is quite powerful. If you couldn’t already tell, I was very moved by these living historians and would encourage anyone who has the opportunity to attend one of their events. 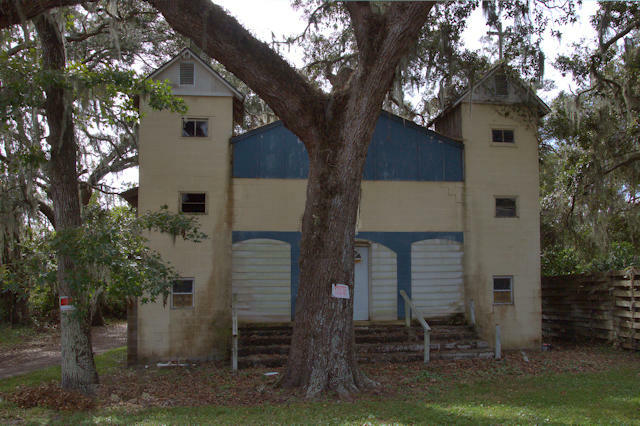 Portions of this church were originally built by freed slaves on nearby Broadfield (now Hofwyl-Broadfield) Plantation in the late 1870s, where it was known as Broadfield Baptist Church. It was removed to this location and took on its present appearance in 1885. 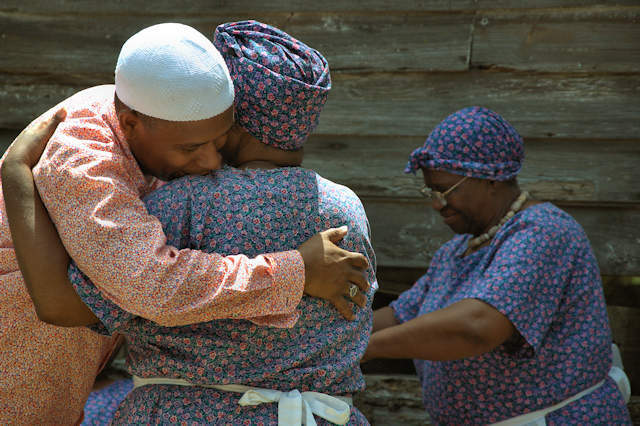 It’s one of the most important remaining African-American vernacular churches in Georgia and a familiar landmark to travelers along U.S. Highway 17. It’s just south of the McIntosh County line. I panicked this morning when I heard a rumor that Hazel’s had been demolished, but concerned friends on St. Simons quickly checked and let me know it wasn’t true. 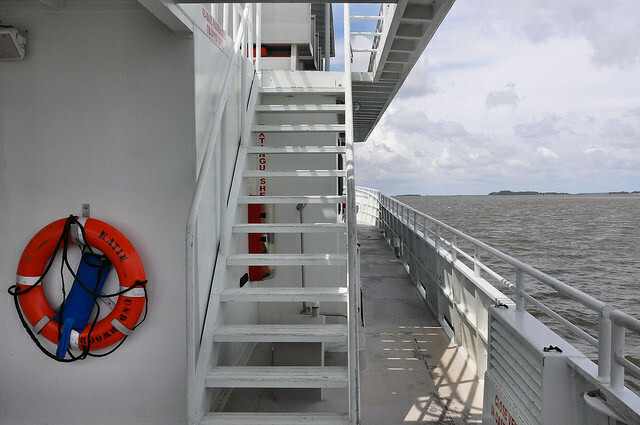 To many, this place is as much a symbol of the island’s history as the lighthouse or Fort Frederica. Located in the nearly forgotten African-American community of South End, Hazel’s was owned by Hazel and Thomas Floyd. [Thomas was a direct descendant of Wanderer survivor Tom Floyd]. Thomas, a veteran of World War II, settled here with his wife shortly after World War II and soon thereafter they started this business, which would be a staple of St. Simons life until it closed in 1978. [They lived in the house next door, which is still standing]. 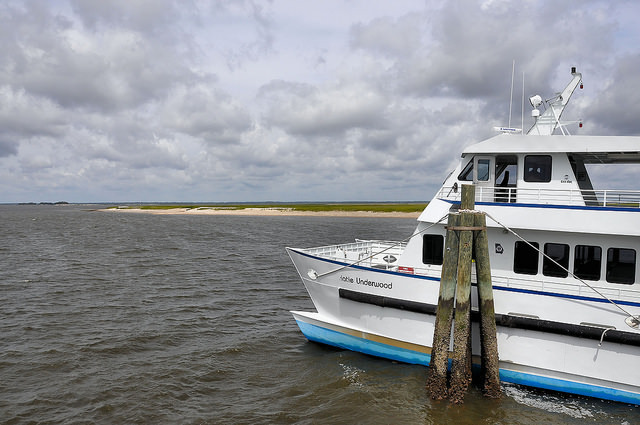 With new homes and condos dotting the island today, it’s a nice step back to a time when St. Simons, like all of the Georgia coast, was anchored by small but thriving communities who looked to family and friends as well as the rich coastal waters surrounding them for sustenance and survival. 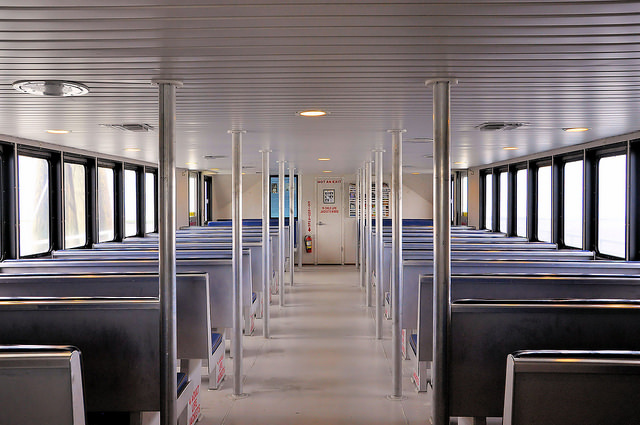 Hazel was known to go crabbing in season and bring back her catch for the night’s special of deviled crab. I’m sure they were legendary dishes in their time.